Donald Trump's campaign manager Corey Lewandowski was charged Tuesday with battery of former Breitbart reporter Michelle Fields. Lewandowski was released with a notice to appear and no mug shot is available, Jupiter Police Department Public Information Officer Adam Brown said. The police department in Jupiter, Florida released the arrest report Tuesday morning along with video footage that shows Lewandowski reaching out and touching Fields at the end of a Trump press conference earlier this month at Trump National Golf Club in Jupiter. The report says Fields came to the Jupiter Police Department on March 11 to report a battery that happened four days earlier. Officer Marc Bujnowski said he interviewed Fields about the incident. The affidavit says at the press conference, Fields asked Trump a question and suddenly felt someone "yank her left arm." It goes on to say, "She added that she fell back, but caught herself from falling." "Fields showed me her left forearm, which revealed bruising from what appeared to be several finger marks indicating a grabbing type injury," the officer wrote in the report. The officer said Fields played him audio from her interaction with Trump and the officer then contacted Washington Post reporter Ben Terris who witnessed Lewandowski "yank" Fields's arm and who confirmed what Fields said about the incident. A day after the interview with Fields, the officer said he obtained video footage from Trump security of the incident taking place in the venue's ballroom. He said Fields is seen on the video, which shows Lewandowski extending his left arm out and reaching for Fields's left arm with his left hand. "Lewandowski then grabbed Fields's left arm with his right hand, causing her to turn and step back. 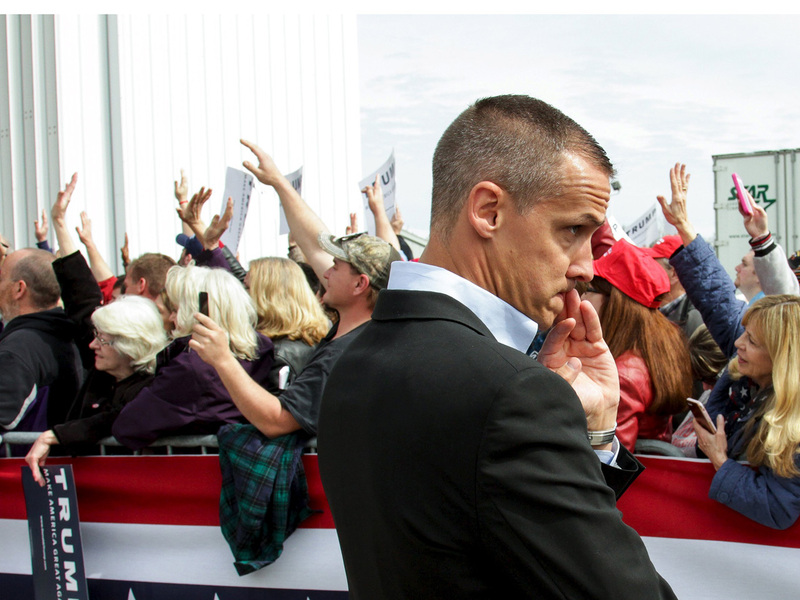 This motion cleared a path for Lewandowski to walk past Fields, allowing him to "catch up" and get closer to Trump, who was walking during this entire incident," the officer said in the report. Based on the department's investigation, the officer said "probable cause exists to charge Corey Lewandowski" with one count of "simple battery" because he intentionally touched Fields against her will. But Trump and his campaign are rejecting the charge. He initially said on Twitter that the video footage doesn't show or prove anything. Wow, Corey Lewandowski, my campaign manager and a very decent man, was just charged with assaulting a reporter. Look at tapes-nothing there! Trump also alleged that Fields grabbed him at the event and asked on Twitter Tuesday if he can press charges. Speaking to reporters before a campaign rally in Wisconsin Tuesday evening on his private airplane, Trump said, "Corey's a fine person" and said he supplied the video footage involved. "Those tapes are conclusive," Trump said. "She's grabbing at me, and he's acting as an intermediary and trying to block her from doing that." "I told [Lewandowski], 'You should never settle this case. You should go all the way,'" he added. "I don't discard people. I stay with people." "Mr. Lewandowski is absolutely innocent of this charge. He will enter a plea of not guilty and looks forward to his day in court. He is completely confident that he will be exonerated," the campaign said in a statement Tuesday. The campaign said inquiries about the incident should be directed to Lewandowski's attorney, who's based in West Palm Beach. "We have total confidence in our campaign manager and we feel that he's going to be exonerated," Trump spokeswoman Katrina Pierson said on CNN Tuesday, adding that she is often "smacked around by TV networks." Ted Cruz's campaign also weighed in on the charge. "Unfortunately, this abusive behavior seems to be part of the culture of the Trump campaign. Personal attacks, verbal attacks, and now physical attacks have no place in politics or anywhere else in our society," Cruz spokeswoman Catherine Frazier said. John Kasich's senior strategist, John Weaver, also weighed in on Twitter. Campaigns reflect the values of the candidate. I know ours does. If this bully worked for John Kasich, he would have been fired long ago. The charge comes weeks after the incident happened. Trump and his campaign have since defended Lewandowski, who has denied that he grabbed Fields's arm at the event. The incident led to Fields and other Breitbart employees resigning from the news organization. CBS News' Arden Farhi, Jacqueline Alemany and Alan He contributed to this report.